New for 2019, Marucci releases a full composite two piece bat. In some sense, this bat replaces the Marucci Hex Composite but uses the two piece connection you could find a CAT 8 connect called the SDX. In another sense, it is an entirely new creation—with new barrel, handle and a two piece design. After using the bat, in particular the drop 5, we thought the barrel absolutely massive. The SDX connection felt great on hits and mishits. The bats swing weight fits right in the balanced area.… Jump to the full review. We aren’t the only ones to have information about the CAT Composite. Other places, in particular those who sell bats, usually have a boiler plate write up on the specs of a bat. Many of those we reference to make sure we are seeing what we should be. Here are some more references for the 2019 Marucci CAT Composite review. In another sense, it is an entirely new creation—with new barrel, handle and a two piece design. After using the bat, in particular the drop 5, we thought the barrel absolutely massive. The SDX connection felt great on hits and mishits. The bats swing weight fits right in the balanced area. Our guess is, Marucci lovers will like the CAT Composite. The CAT Composite is for no joke baseball players. That means, if you play a lot of games, see serious pitch speed and are willing to spend the money it takes to get top end gear then the CAT 8 could be on your short list. The number of drops and lengths make it available for any type of hitter. The drop 10 is a real balanced option, it swings as light as the CF Zen. In a drop 5 expect more swing weight–but that is the point. Hitters who want a new take by Marucci on a proven industry idea—as well as one of the biggest barrels around—will do well with the 2019 Marucci CAT Composite. There isn't a real last year's version of the Marucci CAT Composite. But, for sure, Marucci took what they learned from the Marucci Hex Connect and made it into a better version. Serious upgrades, though, go into the CAT connect including the connect (SCX) connection that is used in the Cat 8 BBCOR Connect. The idea of a two piece composite bat with a HUGE barrel is common in the USSSA space. Companies like DeMarini and the CF Zen, Easton and their Ghost X (Mako), Rawilngs and their Quatro, have been living there, and thriving there, for quite a while. In terms of barrel size, the CAT Composite reminds us most a nearly unherad of bat in the Mizuno Ghost. However, as of 2018, the Mizuno Ghost was only a USA Bat. Marucci has yet to get into the USA space. If we are comparing construction and drop sizes then bats like Easton’s Ghost X and DeMarini’s CF Zen fit the a close competitor to the CAT Composite. Feel on mishits and hits. The CAT Composite is built for a smoother feel and less feedback. The barrel size on the CAT Composite is MUCH larger than the CAT 8. 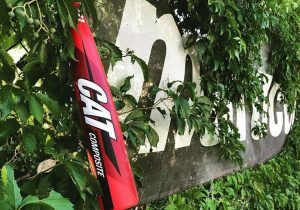 Prices differ—The CAT Composite is in line with other two piece composite bats in the industry. The sound on the CAT 8 will sound much more “pingy” than that of the CAT Composite. The CAT 8 is aluminum while the CAT Composite is, well, composite. Circa 2015, Marucci released a single piece composite bat called the Marucci Hex. In some sense it is the grandfather of the CAT Composite. However, it is a mistake to think the bats are similar. The CAT Composite’s two piece design does a lot for hits and mishits while the Hex Composite didn’t feel too great on mishits. As well, although the barrel size on the Hex was remarkable, the barrel on the CAT Composite is an absolute monster. Marucci’s CAT Connect is a two piece composite bat built with a HUUUGE barrel and nice connection piece. The connection piece, which helps absorb the sting of mishit balls, is the same one used on the high end BBCOR CAT 8 Connect. The bat comes in a few different drops (5, 8 and 10) and, for their class, have a swing weight in the middle of the road. Not too light, not too heavy. (MOI we measured on a 31/21 was 5800 or about 1.5% above the average—well within our margin of error). Unlike other first year release bats, the Marucci CAT Composite comes in a 2 3/4 drop 10, 8 and 5. This wide range of drops is remarkable. Most new bats to the market are bled in through a drop 10 and then trickle down in additional years. We think much of this approach from Marucci can be attributed to their 2-year cycle on release. They had enough time to make a full line of bats. All USSSA Stamped (not legal in USA Bat leagues). Good catch Paul. Thanks for the note.